My birthday lands right at the beginning of April – it’s a time when the temperatures can jump from 75 to 45 in a single afternoon and there’s more likely than not going to be a blizzard. Every year I keep my fingers crossed for a nice warm birthday – where I can wear a sleeveless dress and flip flops. I wish for a birthday that will see me sipping a cocktail on some patio in the warm rays of an afternoon. This is all entirely unrealistic. 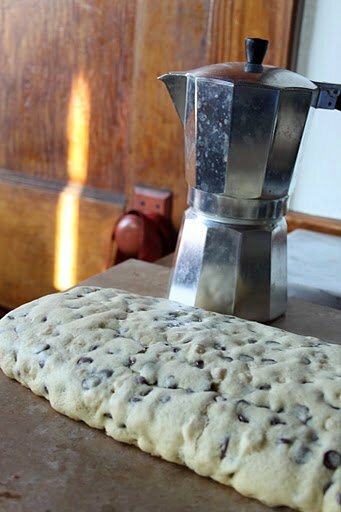 So, instead I settle for giving myself a day of baking – the kitchen is always warm with the oven on and it is quite sunny. Each year I see my birthday as a baking challenge – a chance to try something I haven’t tried before that I’m daunted by. My birthday is an opportunity to try those recipes that could be potential flops – that way if I mess up someone’s birthday cake it’s MY birthday cake. No harm no foul, right? This year was no different. EXCEPT instead of going out for dinner with BF and my sister I chose to conquer Momofuku Milk Bar. 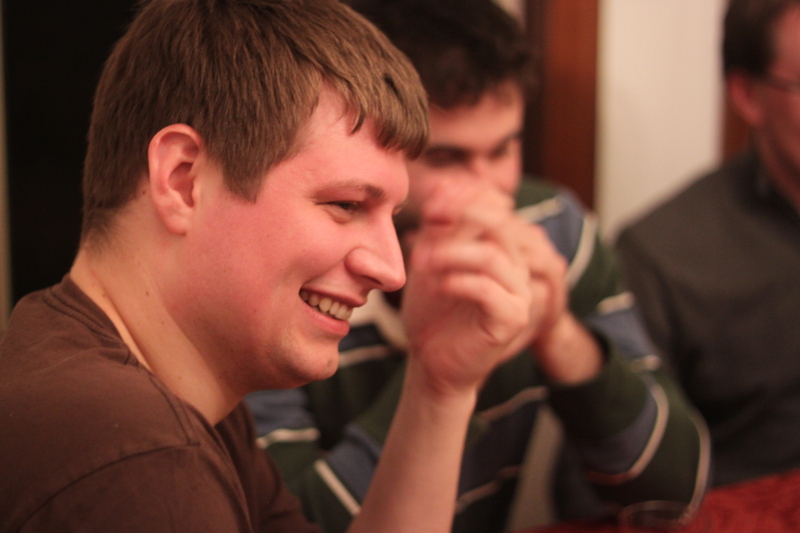 I threw a dinner party. I made a ton of pasta and asiago cheese riddled focaccia. I invited BF’s and my favorite people over, we drank wine and ate good food. Dan and Mandi made a great sauce that went perfect with the I-drank-too-much-wine-last-night day that followed. Megan made a lovely spinach salad and there was liberal pouring of wine and beer. It was, truly, the best birthday I could ask for. But, in my brilliance, I decided that making two cakes that both required at least three separate pre-made ingredients and a whole bunch of love was the best way to top off this grand evening of debauchery. I made both of these cakes pretty much exactly according to the recipes – my variation was that I used liquid cheesecake in the chocolate chip cake instead of passion fruit curd. The cheesecake was WAY more accessible. I’m not sharing these recipes today – they are too complex and my pictures are MIA as my hands were typically too much of a mess to photo-document this process. SO all we have left of this cake is a remnant and these pictures. There were twelve of us at the party. We ate most of both of these cakes. I loved them. 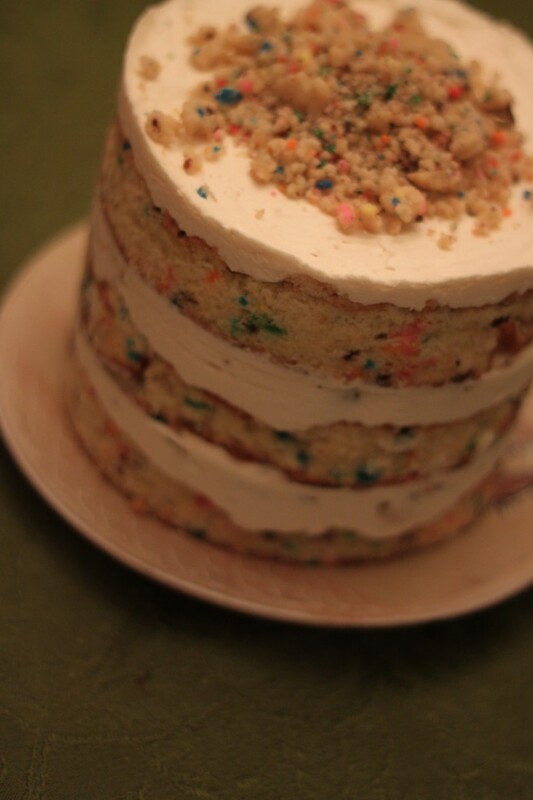 And I will assuredly be baking from Momofuku Milk Bar again soon. Thanks for the picture Rachel! I wasn’t going to post this recipe initially. 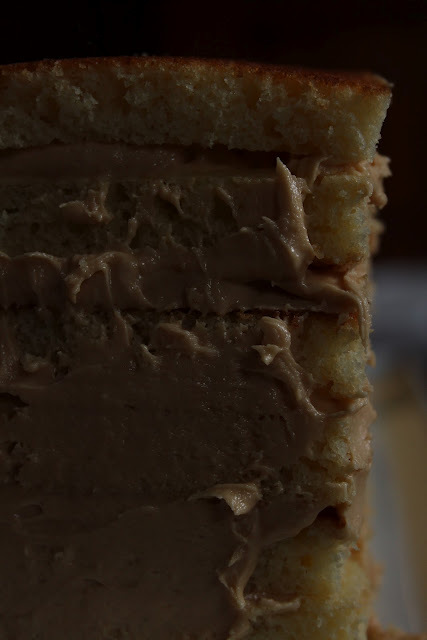 The cake recipe is an old one (a favorite that I use all the time) and the salted caramel frosting is directly from another blog – but BF told me I needed to share it because a six layer confection of frosting and cake should be shared. Because I hadn’t initially meant to blog this there are only pictures of the cake as it was built, but don’t worry about that. Marvel at the cake – six layers of yellow cake, salted caramel frosting sandwiched between each layer, coated with decadent chocolate truffle cream frosting, and topped with drizzles of caramel sauce. 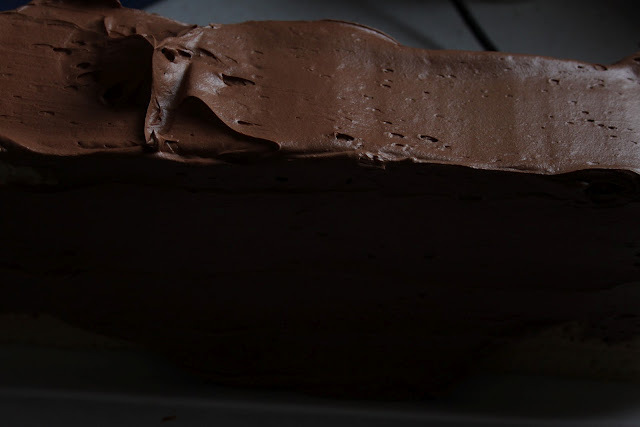 I had been playing with the idea for this cake for quite a while – it’s a take on Smith Island cake, which just had chocolate frosting and filling. But BF isn’t the biggest fan of that much chocolate and I’ve been wanting to make salted caramel frosting, so it seemed a natural fit. I made this cake to bring over to Rachel and Joel’s as a pairing with a fantastic meal of braised lamb shanks and potatoes au gratin. Which meant I baked all day and left an obscene amount of dishes in the sink. But it was worth it. Let us not forget the chocolate truffle frosting, either. This frosting is sort of a mantra for my mom who tells me that it is THE chocolate frosting I must make if I’m looking for it. My mom found this frosting about nine-and-a-half years ago, while she was pregnant with ‘Tonio and swore she wouldn’t ever make another one. 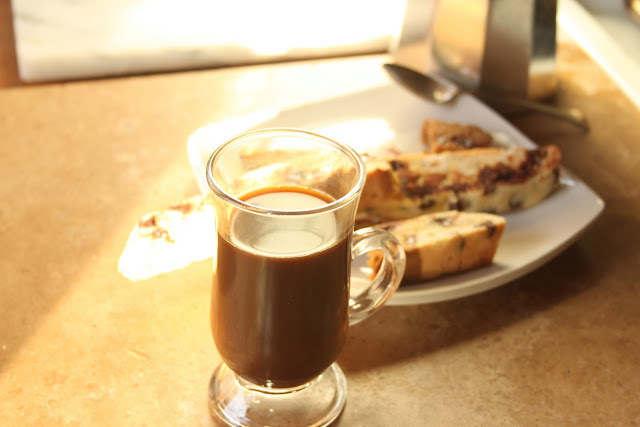 I tend to agree with her – it’s fantastic, decadent without being too sweet, and rich without being overpowering. It paired perfectly with the salted caramel frosting. 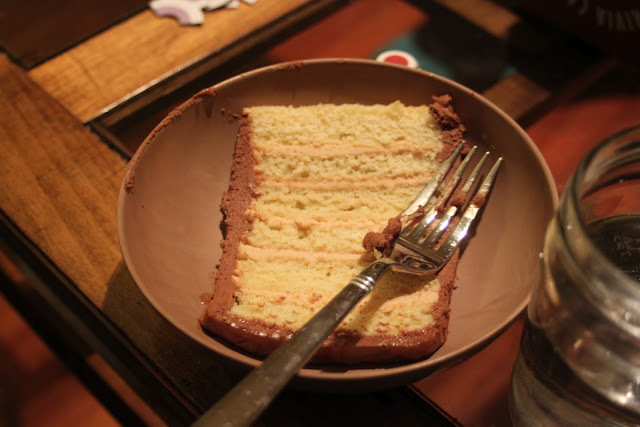 Now if only we all had enough room to eat a whole 3″x14″ six layer cake, instead we all had thin slices and cursed the epic amount of cake I made. Oops. The cake is all my design! The cake recipe I used is one I put up here a long time ago. The salted caramel frosting is from this post, over on My Baking Addiction, I made just the caramel sauce to put on top too. This recipe makes enough to frost and fill a two layer cake. In a wide heat-proof bowl (I use a shallow metal bowl) whisk together the yolks, sugar and espresso until fully combined and frothy, about 30 seconds. Add the boiling water 1-2 Tbs at a time, whisking between additions, until fully incorporated. Place a bowl in a frying pan with at least an inch of water in it (the idea here is basically a wide flat double boiler). Bring the egg, sugar, espresso, water mixture to a temperature of 160 degrees, stirring occasionally, and remove it from the heat. Add the chocolate and butter, mix until smooth. If you find that the chocolate/butter aren’t melting you can put them back in the pan with water in it (turned off, the water should still be warm enough to melt chocolate). Allow the frosting to cool, in the fridge, fro about twenty minutes if you want to use it as a spreadable frosting. Or just pour it over your cake if you just want a glaze. Enjoy. There should be cake on the top and bottom of the whole thing. After you have filled the cake go around the edges with an offset spatula (if you have one, I used a butter knife). 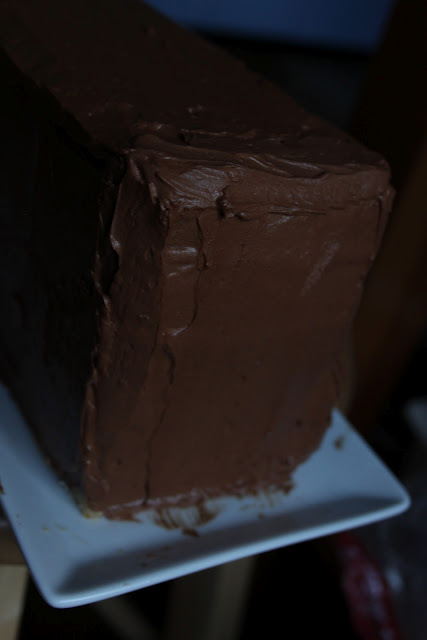 Then coat the whole cake in chocolate frosting. If you made the above frosting (which I can’t recommend highly enough) then you should have enough for about 1/8inch think frosting over the whole cake. 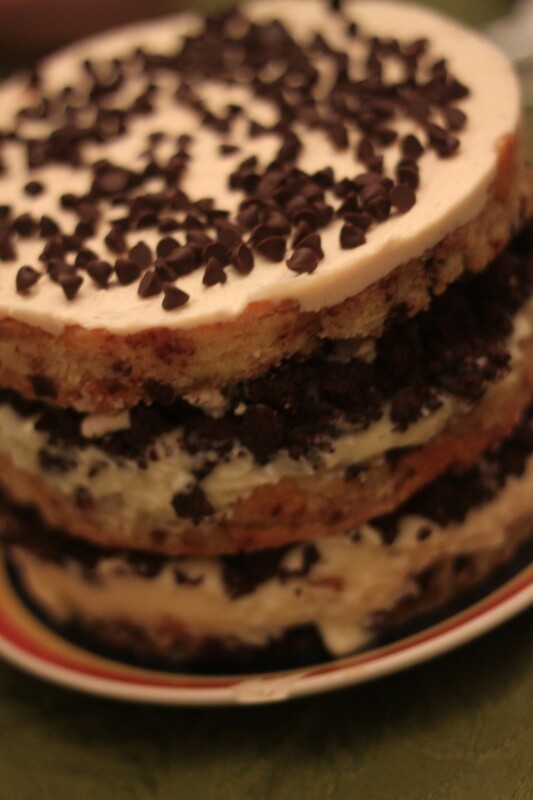 You should check out Test Kitchen for tips on cake frosting, they’re awesome. 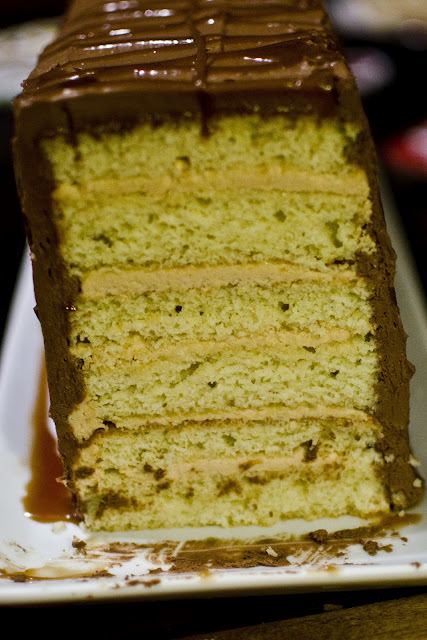 Last of all, top the whole cake with a drizzle of caramel sauce in whatever pattern you want. Adding this caramel helps tone down the richness of everything else and is an important step, don’t skip it. Then take this massive cake and share it, with at least ten other friends. You will want to eat it all by yourself, this is a bad idea. Also, taking it on a long, packed train/bus ride is not a good idea. Trust me, I tried it, the cake got, well, smooshed. I love chocolate of all sorts. 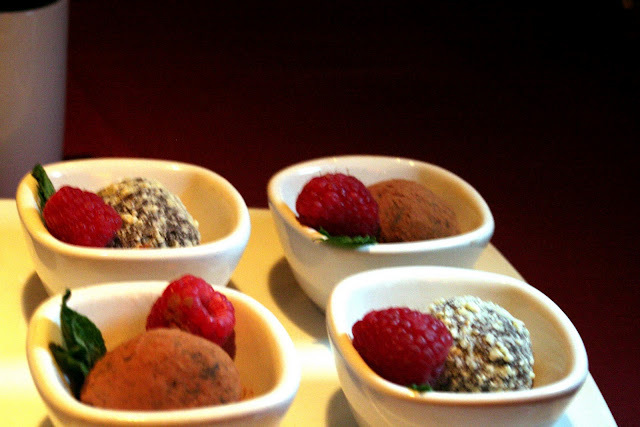 I will eat chocolate anytime, its familiar and comforting in a nostalgic way. 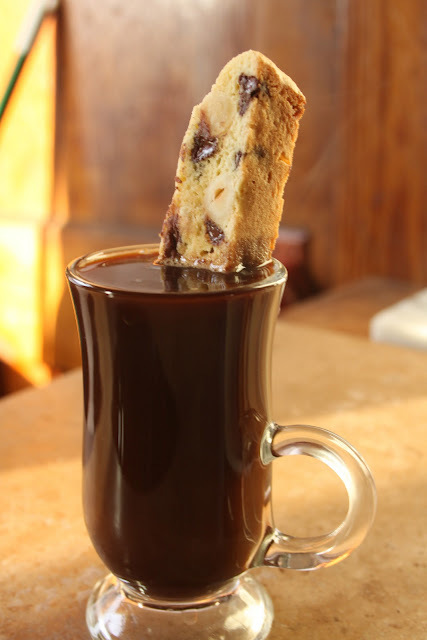 I love that first bite into a handmade chocolate that makes my mouth want to do a jig, or the soothing way chocolate melts at body temperature. 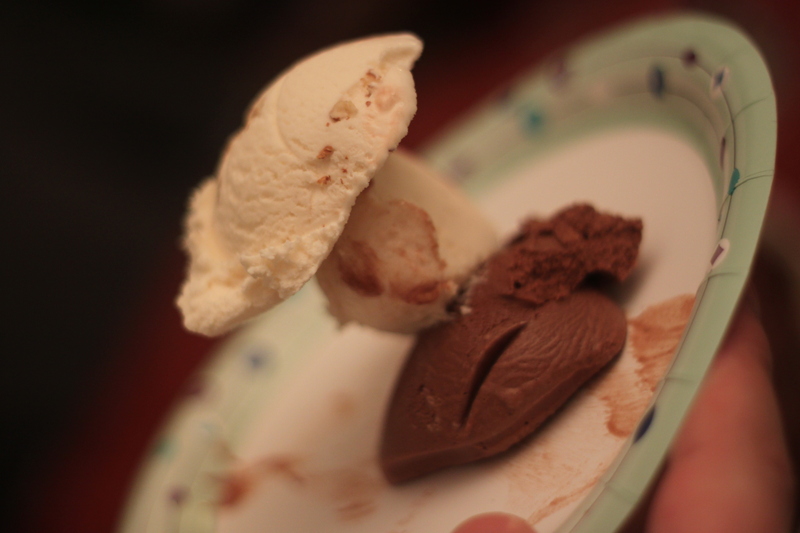 I am convinced that chocolate would solve most problems and that nothing else calms most ills. I have been lucky enough to test this theory time and again in all situations and at all times. I love it. I periodically get the opportunity to eat chocolate like this, decadent dark chocolate with additions that make me swoon and one weekend day I had an opportunity like that. On the afternoon of July 30th I was given the fantastic opportunity to sit down with the totally charming Valerie, owner and chief candy-maker-extrordinaire of Vianne Chocolates. Vianne Chocolates is one of the specialty vendors at last year’s Boston Local Food Festival and then I only briefly met her as I showed her to her booth. 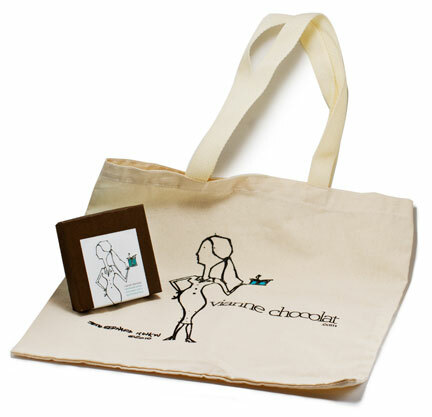 As I sat down to interview Valerie she gave me a marvelous linen bag full of goodies! I immediately fell in love with the sketch on the bag and all of the packaging. Made by a South End artist these little sketches are a fun and creative way for Valerie to show her local love, and does she have local love. 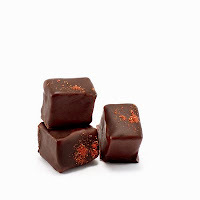 This girl hails from the wilds of New York and tries as hard as possible to incorporate local produce, jams, herbs, whatever into her chocolates. From using Kate’s of Maine butter (yay, totally rocking the Maine pride) to using mint she grew herself (!) and sourcing her more obscure spices from Christina’s Spices in Inman Square, Valerie is all about keeping as much as possible local and sustainable! 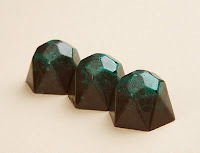 I wrote this post for the Boston Local Food Festival blog back in the fall, however if you are struggling for a some good Christmas gifts Vianne Chocolates will definitely fit the bill of that person with a sweet tooth. *All photos in this post are courtesy of www.viannechocolat.com. This post has been brought to you by kathycancook’s very own “BF”, who also sometimes writes in his own blog. 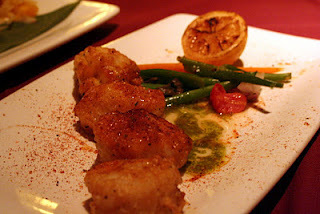 A few weeks back, Kathy was invited to a blogging event at Fleming’s to experience their new small plate menu items. These type of events more-often-than-not fall into the category of “fun, but gastronomically unremarkable” (even more so when the restaurant is a national chain), so I considered passing on this one, but decided to tag along as a plus-one, aiding with pictures and review-related-thinking-activity-things. What I can report back is pleasant surprise. We were treated to a series of dishes, each one vying for my affections by exploiting my different culinary vices. Like children, I could not choose a favorite and had to eat each one multiple times. As such, I’m going to review each dish briefly so as to avoid gross keyboard-unfriendly drooling. 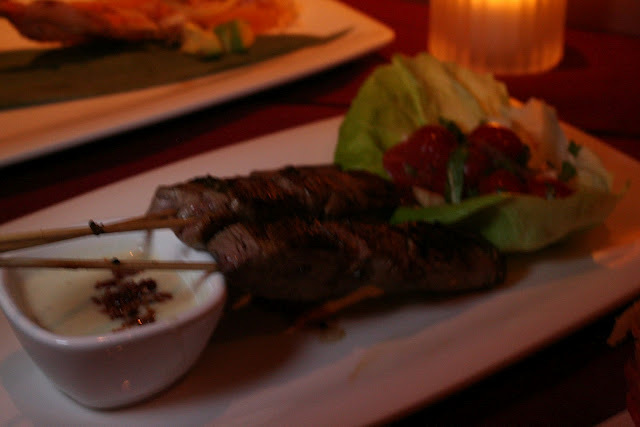 First up on this new lineup is the Filet Mignon Skewers. The skewers were cooked perfectly (rare-medium-rare for-the-win) and was accompanied by “the Sauce”. The Sauce is comprised of two-parts Gorgonzola, one-part bacon, and thirteen-parts jackalope magic. After being the first to taste it, I promptly (and secretly) snuck around the room looking for anything I could dip into it so as to maximize the relocation of whatever Sauce that was present from cold, unfeeling porcelain dishes into my stomach. Assume from this point forward, that all the other dishes I tried were first consumed as they were intended, and then again with gratuitous amounts of the Sauce drizzled all over. 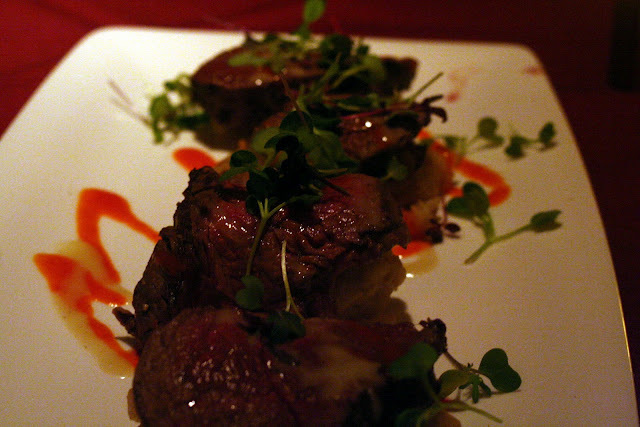 Next came the Sliced Filet Mignon. Let me just re-iterate again here how perfectly this and all the other meat was cooked. My experience has been that most places (including steakhouses) have difficulty hitting that rare-medium-rare sweet-spot – Fleming’s nailed it each and every time (and let’s face it, if you’re eating over-cooked meat, you might as well not bother). 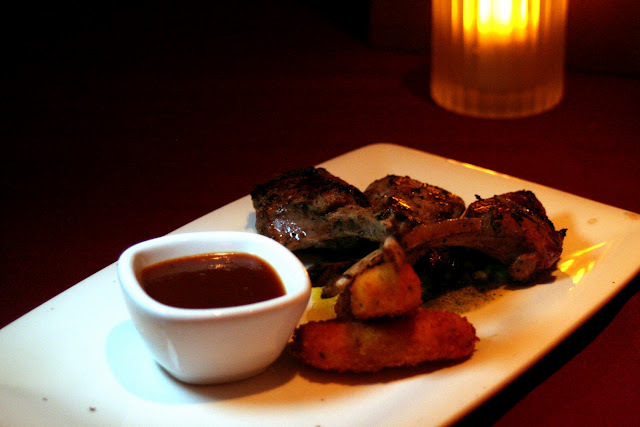 I’m not a huge fan of chops as a finger food, but these lamb chops were delicious and accessible. 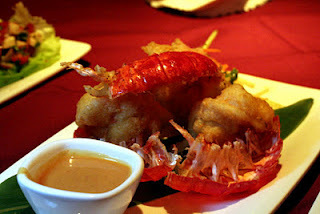 Let’s also not forget the seafood offerings. 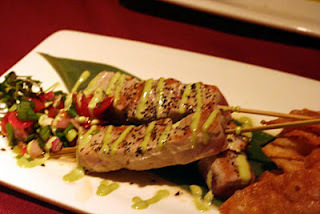 We tried their tempura-breaded lobster, shrimp skewers, Ahi tuna skewers, and scallops. Full disclosure: I am not a seafood fan, save for very few, very specific exceptions. 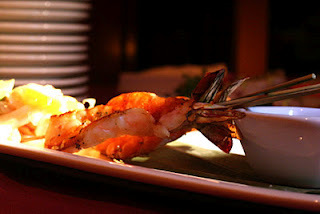 I tried each of these dishes, and was surprised to enjoy each one – they were actually on par with my all-time favorite, steak (which is nearly blasphemy in my book). 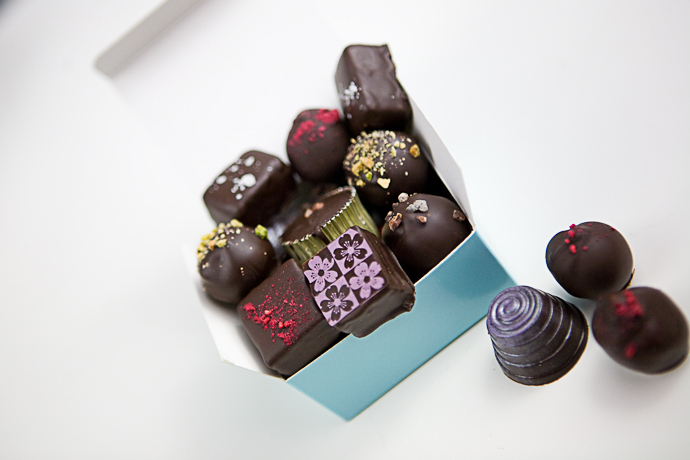 We wrapped up with espresso and white chocolate-covered chocolate truffles, which were their own kind of heaven. I won’t lie, I was surprised by the quality of Fleming’s dishes. While I don’t consider myself a particularly discerning foodie, I recognize the difference between “pretty good” and “fantastic”. If the quality of these dishes are what can be expected at every visit, I’ll be adding Fleming’s to my list of regular places to eat. We were also treated to red and white variations of wine, though I don’t feel terribly qualified to judge them. I enjoyed them plenty, but wine is one of my regular blind spots. 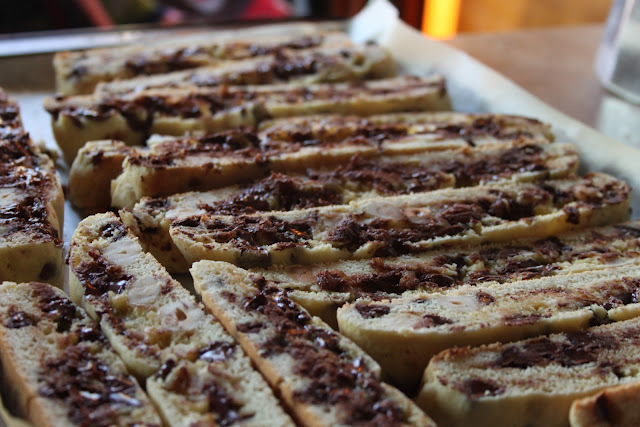 The event was complementary, but as is the norm here at kathycancook, our opinions are our own.